Haunted houses. Scary movies. Frightening books. Stephen King. Horror. All of these words simply bring terror to someone like me. The people who I work with at The Group Real Estate, love to give me a hard time about this. I recently talked about the Museum of Idaho in Idaho Falls doing a haunted tour of the Old Town parts of Idaho Falls that have a tough, scary, and horror type past. This led me to wanting to write about this idea of being scared, or better said by others, the want to be scared. I’ve always hated this idea. One day, you need to sit down with my next door neighbor and ask them about the time we went to Dr Slaughter’s house to go through it, and I made them stay outside as I whined and complained about how much I hate being scared. So, I literally talked us out of going in, by wasting a good hour of our date night, though still giving them a great laugh through the entire situation, as a whole. Then there was the night before my second daughter was born. 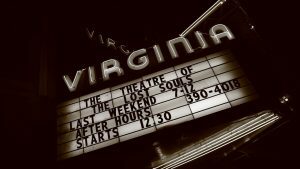 We went through the Theatre of Lost Souls in Shelley, Idaho. As we went through the theatre, there was only laughter at me. My bro-in-law wanted me to go first so they could all laugh at me. At one point, down in the cellar, there was a little boy at the bottom of the stairs, dressed in all black, and it took me a good 10 minutes to get past him. People behind us yelling at me to move forward. And it was all my fault. However, here is the best part. We got to the room where the chainsaw guy was gonna be. There was meat hanging and I knew he was in there. I saw an Exit to my right and to my left. As I heard the chainsaw rear its loud noise from the left, I threw my pregnant wife and my friend to the ground, yelled, “RUN!” at the top of my lungs, and took off running until I was out of the building. I had left my pregnant wife to get chopped up by Jason Vorhees. Our second daughter was born the next morning at 5am, 6 weeks early. People love to experience this phenomena due to the adrenaline that is released in our fight or flight response. Our brain and our body run on adrenaline at the exact same time when this happens. When we are in a state of peril, whether that be mental or physical, our body reacts in a way to either fight or to flight. Now, in the experience of the Theatre of Lost Souls, I decided on flight. Zero fight. Most people are able to determine that what is happening is fake and due to it being fake, the body and mind go through a certain type of “high” when they experience fear. This is especially true when watching scary movies, this way we aren’t actually in the fray, as it were. Our minds are the ones that are going through the fight or flight response. And when this happens, we go back and forth between being scared, then feeling happy about that moment happening. Due to this, the body and mind love being happy. So we are, there in, happy after the fact, which is where the main good feelings come from. The idea of being in a safe place, knowing that we are safe and in a fun environment, we are basically able to control the adrenaline that is dispersed in our bodies. When this happens, we are giving ourselves a purposeful high. So, with that being said, why don’t we just seek out happiness? Maybe a haunted house, or two, that tell us funny jokes or let us watch reruns of The Office? I have found that I still have problems in my mind the same way a child does. My brain pan doesn’t realize that it is fake when I am in the moment. As with a scary movie I watch, I am plagued by that movie for months, sometimes years, as I am in the dark, wake up at night to noises, etc. Whichever you may be, I hope you get your fill of scares, or lack thereof, this October. What a great month and a fun way to start a beautiful Fall season, leading into the wonderful holiday season.